Playa Vista & California Department of Fish & Wildlife are clearly draining the freshwater marsh sending water out the culvert into the Ballona Channel lowering the water level and drying out Ballona Wetland. Please click on the video to watch the 1/20/19 draining of the freshwater marsh. This culvert throws away Ballona's freshwater to the Ballona Channel and out to sea. Previous to the dry roadway and dried bank of the marsh, shown in the photo above, this area was overflowing fresh water into Ballona Wetlands Ecological Reserve, during our recent rains on Ballona. 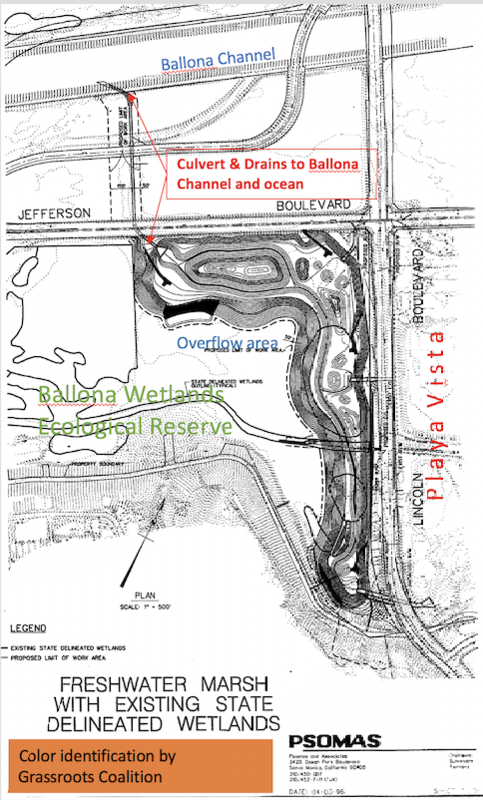 The area above shows the overflow section of the freshwater marsh in Ballona Wetlands. It was designed to allow for overflow of ponding water, however as is seen in the video above, the waters are being drained away from this portion of the marsh to stop the water from reaching Ballona Wetlands Ecological Reserve. It works! The drainage drys up the wetland. This throwing away of Ballona's life-giving freshwater is an abomination. The required state and federal agency oversight for the healthy maintenance of Ballona Wetlands Ecological Reserve and this "Freshwater Marsh System" includes the System's impacts upon Ballona Wetlands Ecological Reserve. However, state and federal oversight has been absent in protecting Ballona's freshwater heritage-- which includes both winter rain, ponding water and year round flows of groundwater. Instead of protecting Ballona's freshwater, our agencies have, instead, let oversight by the Playa Vista development --adjacent to the wetland-- throw away the beneficial freshwater of Ballona as is seen above, draining the life-giving freshwater into the ocean. Ballona's groundwater is being constantly removed through Playa Vista's active pumping and dewatering systems which send the clean freshwater into the Santa Monica Bay and/or into the sanitary sewer. 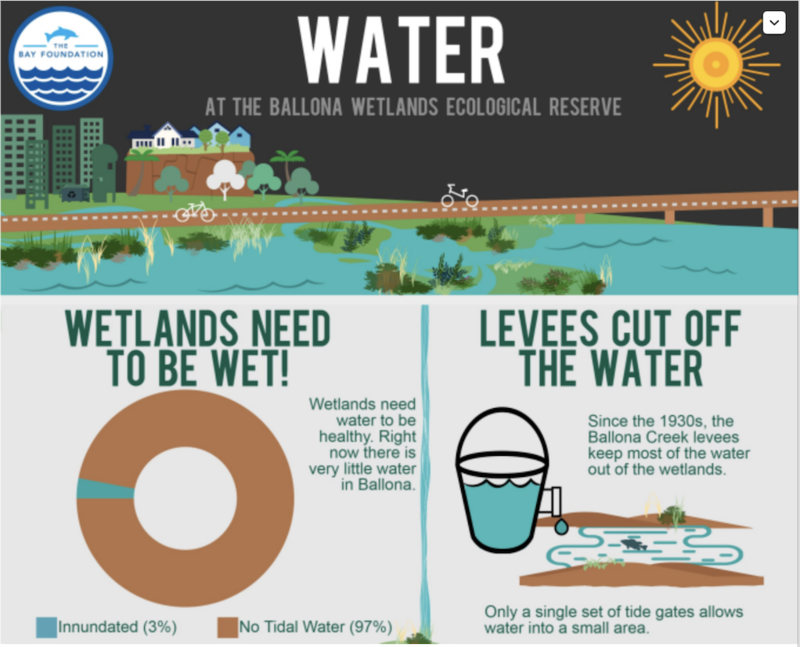 There has been failure to allow Ballona Wetlands to function as a wetland, both cleansing the runoff and providing needed recharge to the underlying aquifers and failure to protect surface water ponding for use by flora and fauna. 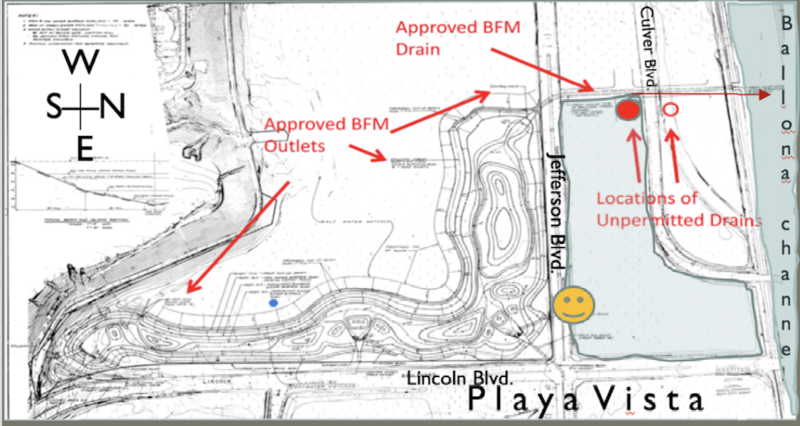 The approved outlet for the freshwater marsh was approved in 1990, long before the public acquired Ballona as a Reserve, during a timeframe of approval for additional Playa Vista development west of Lincoln Blvd. That Playa Vista development has been stopped by the public and accordingly, Ballona's freshwater needs to be returned and restored to Ballona for its benefits to the wetlands and the underlying freshwater aquifers. 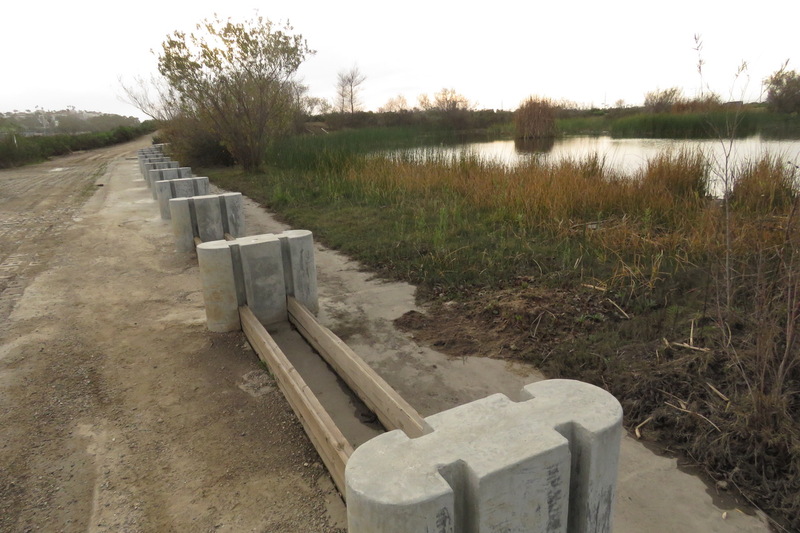 Instead of protecting and enhancing the ecological functions of Ballona Wetlands, Playa Vista and CDFW are arguably working together to destroy the Ballona Wetlands by removing and diverting all of the historic freshwater flow into the Reserve. Oversight agencies such as the California Coastal Commission Staff, The State Lands Commission and the Army Corps of Engineers have been turning a blind eye to this devastating diversion of freshwater replenishment for Ballona. "We think that draining a wetland is about the most amazing violation that you could have." "I mean, putting a drain in a wetland is exactly the opposite of anything that you'd do in a wetland." While vocalizing how wrong it is to drain a wetland, a blind eye is being turned to the massive drainage and throw away of Ballona's freshwater via the so-called"Playa Vista "public benefit project" that is the Freshwater Marsh System(System). The System is being run by the private developers of Playa Vista. -This System was never approved by the Coastal Commission to be run solely by a private developer. to be run solely by the private developer(s) of Playa Vista and yet this is what has occurred. - Is this not a gifting of public funds' to Playa Vista? A gifting of public funds' to promote the private development business that is Playa Vista, which needs to remove its groundwater in order to buildout the development site? Such blatant, needless diversion and throwing away of life giving freshwater is arguably illegal under all the former agreements that have occurred pertaining to Ballona Wetlands but also illegal according to both old precedent setting cases involving the State Water Resources Board Resolution 88-88 (wasting water) as well as new laws such as the 2014 Groundwater Protection Act. Why is this allowed to occur? Enforcement Staff of the Coastal Commission have cited that it is a violation of the Coastal Act to harm the Ballona Wetlands by taking away its life giving water. 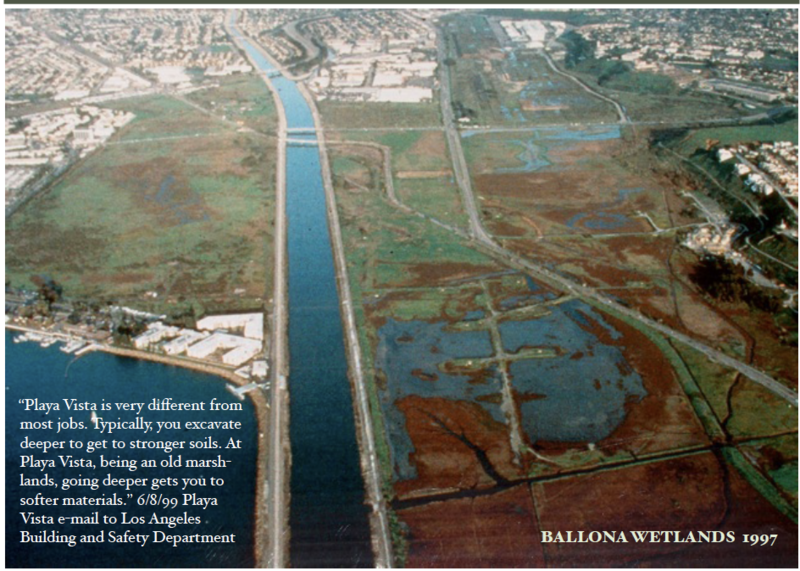 The Freshwater Marsh System was intended to insulate Ballona Wetlands-west of the freshwater marsh from construction impacts of Playa Vista, not allow for negative impacts to Ballona Wetlands via diversion and throw-away of the freshwater that would normally flow or rain into Ballona Wetlands. The original Army Corps Permit did not permit the freshwater marsh system's freshwater to flow out of Ballona Wetlands; it was only after Playa Vista requested the diversion into the Ballona Channel, that the Corps allowed for such diversion since their jurisdiction covered the Ballona Channel and the Corps determined the outflow would not harm the Channel itself. Coastal Commission Staff comments below, recite the harm to Ballona Wetlands from the unpermitted drains. The comments resound with the similar onslaught to Ballona Wetlands that is being caused by the diversion and throw-away of Ballona's freshwater in the Freshwater Marsh System-- draining it into the ocean and not allowing the freshwater to enter Ballona Wetlands Ecological Reserve. "... a continuous detriment to wetland hydrology and habitat that relies on water to function." Every year CDFW allows Playa Vista to drain the freshwater marsh into the ocean rather than allow the freshwater to stay in Ballona Wetlands. HOW BALLONA'S FRESHWATER NEEDS TO BE USED to beneficially serve the wetlands and its underlying freshwater aquifers. BELOW is video from 2017 showing how water from the freshwater marsh system flows into the Ballona Wetlands Ecological Reserve when it is, occasionally, NOT DIVERTED. 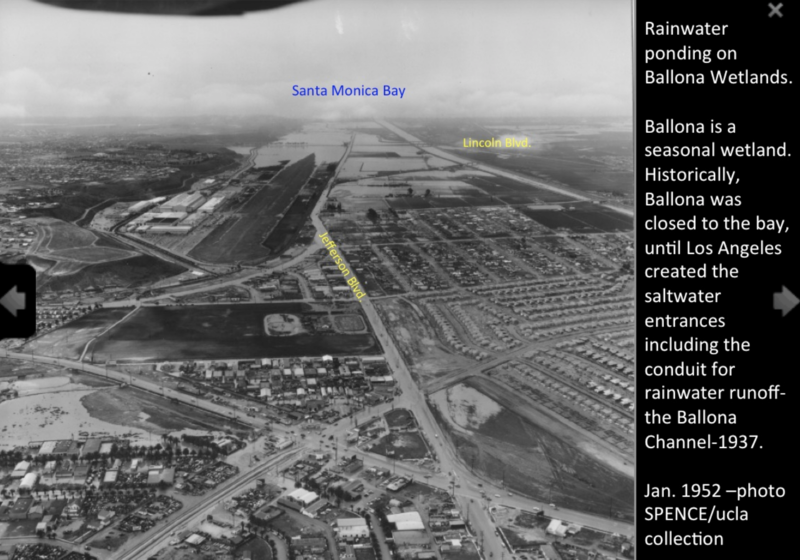 This video serves to document what happens during a rain event when the rainwater is allowed to accumulate and flow, at least short term, into Ballona Wetlands. 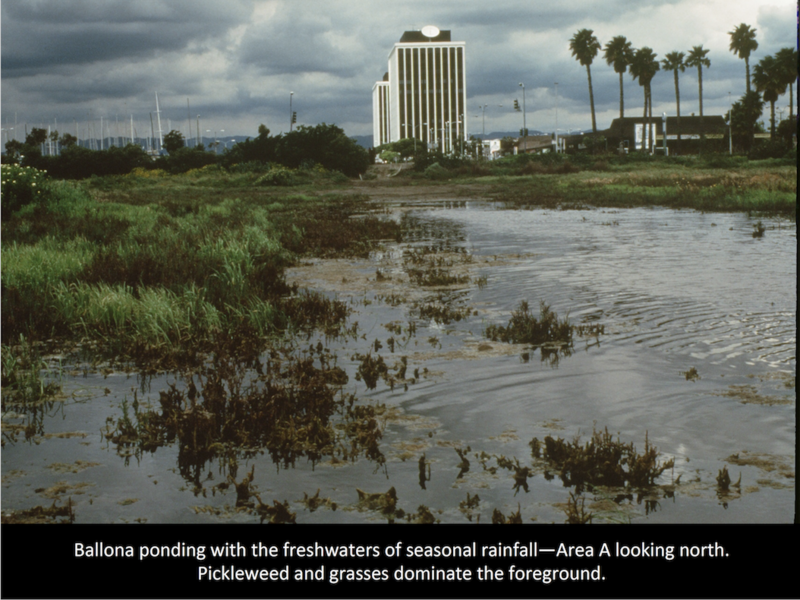 Since, the acquisition of Ballona, via public bond funds, the state has allowed the private Playa Vista developers to maintain control over the Ballona freshwater marsh system. The basis to DIVERT AND THROW-AWAY this much needed freshwater is not accounted for by Playa Vista. And, thus far, no agency has made attempts to require accountability for consideration of the negative impacts that are occurring due to the diversion of Ballona's water. There is nothing in the Environmental Impact Report (EIR), for Ballona's restoration, that addresses the actual hydrology of Ballona. There is also nothing in the EIR that notifies the public or any agency that fresh water is continually being diverted and thrown away before reaching Ballona. Additionally, the existence of the illegal drains and the negative impacts upon Ballona Wetlands Ecological Reserve are not discussed or analyzed. However, CDFW and CCC Staff have falsely argued during Coastal Commission Meetings, that these issues are a part of the EIR when reality is, that the public has had no opportunity to even know that this freshwater drainage has been ongoing for the past 20 plus years. 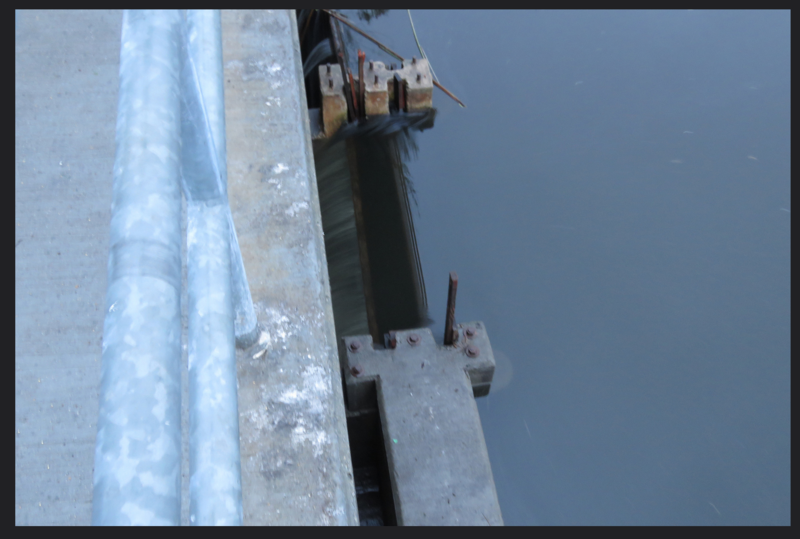 The State Coastal Conservancy and a private business (The Bay Foundation) that is recipient of state funds, never provided any hydrology studies of Ballona itself and never alerted the public or any agency to the continual dewatering and drying of Ballona via Playa Vista's perpetual dewatering activities. The video below shows what it looked like on February 17, 2017. During this rain event, water goes out the freshwater marsh back gate onto the spillway, fills the overflow basin and runs out into Ballona wetland and provides recharge to the underlying aquifers. This beneficial use of Ballona's freshwater is what should be the normal use of waters in the freshwater marsh system. 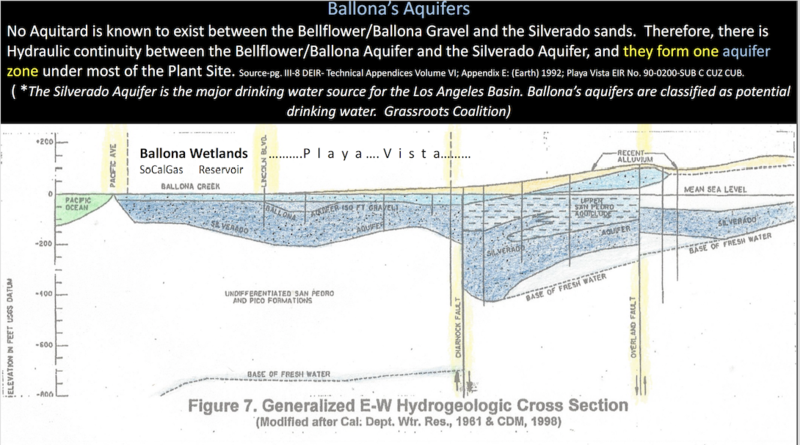 To promote the false and misleading information in Ballona restoration studies; the Bay Foundation, and CDFW created highly misleading information about Ballona Wetlands. Below is their ad promoting the false premise of Ballona as a salt marsh and opining that restoration can only be done by digging out Ballona-- removing the levees to let in the Santa Monica Bay-- turning it into the Ballona Bay. Contrary to the unfounded comments by The Bay Foundation below, the levees DO NOT keep most of Ballona's historic water out of the wetlands. Ballona's freshwaters are instead, being systematically drained away from Ballona. LEVEES CUT OFF THE WATER"refers to SALTWATER as cited by.."Only a single set of tide gates allows water into a small area." WHY DO THESE PEOPLE NOT ADDRESS THE FRESHWATER FLOW OF BALLONA WETLANDS? Follow the money. The groundwater still flows, and as is shown in hydrology studies done for the development of Playa Vista"the groundwater is at or near surface. Rainwater, in the Reserve, would still pond if not systematically diverted and thrown away under the direction of Playa Vista. The fraud upon Ballona, citing it as a salt marsh, must stop. Ballona Wetlands is a unique and now, very rare wetland type in California. Ballona is a predominantly freshwater, seasonal wetland. The freshwater of Ballona Wetlands needs to BE PROTECTED NOW, and not thrown away.